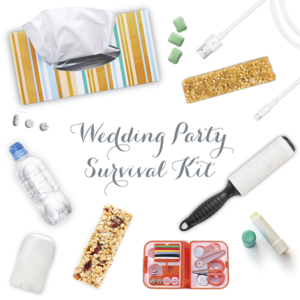 Having an unprepared wedding party just isn’t an option for you. That’s why we have compiled a list of must-haves for a survival kit. Give the kits to your party members the day of your wedding! This list should cover all the bases of what could happen on your big day. Jazz up all this stuff in a cute bag or box. Your wedding party will love it! Belle knows that it’s what’s inside that counts – but it doesn’t hurt when the outside is a thing of beauty, too! a final touch. Everyone will love being your guest for such an enchanting time on your magical day! There can never be too much sweetness at a wedding! For a unique touch, add a candy bar to your wedding reception. We suggest having ¼ to ½ lbs. of candy per guest. Have a theme or color scheme picked out to make your candy bar look organized and clean. Also, be mindful of certain candies melting and food allergies. Try to keep your candy bar in a cool place away from the sun and clearly label each type of candy. Having a candy bar attendant is a great idea to make sure it remains clean and stocked the duration of your wedding. If you don’t have someone to help out, have the candy bar out as guests are leaving. 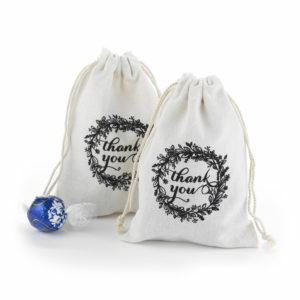 Lastly, your guests will need something to put their treats in. 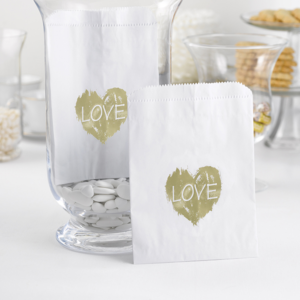 We recommend the Brush of Love Treat Bags or Rustic Wreath Cotton Treat Bags We love the trendy gold foil and how it turns an ordinary paper bag into something chic. A southern belle like yourself deserves the wedding of your dreams. Keep things classic with a plantation wedding! Of course, you will need the perfect invitation. 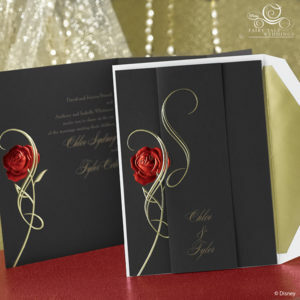 Use our Sumptuous Rose Invitation – it is the epitome of elegance. Have the ceremony and the reception outside the plantation, allowing you to show off the beauty of the grounds and the architecture of the house. Linen tables with crisp white cloths. For centerpieces use luscious greenery with your choice of flowers. We think using primarily white flowers with an accent color to make things pop will really impress. Maybe even add in some cotton peeking through the greenery. Try having a naked cake instead of the traditional wedding cake. This popular trend looks so elegant and chic. Cover the cake in beautiful flowers and fruits for pops of color (and taste). Release paper lanterns at the end of your wedding. Not only does this make for a picture perfect moment but it is also considered good luck! If lanterns aren’t your thing, you could do a sparkler send off instead. It’s equally as pretty and fun! Monica’s Word on Atlanta, Art and Entertaining! Glitter, what is it good for? Absolutely everything! Glitter isn’t just for art class anymore, nowadays brides just like you are finding nifty ways to incorporate glitter into their wedding for the perfect touch of glamour – and we absolutely love it! Here are a few of our favorite glitter ideas that we wanted to pass on. 1. Reception tables- go straight for the blinged-out look and use a glitter table cloth. This is an easy and inexpensive way to jazz up each table. Not looking for so much glitter? 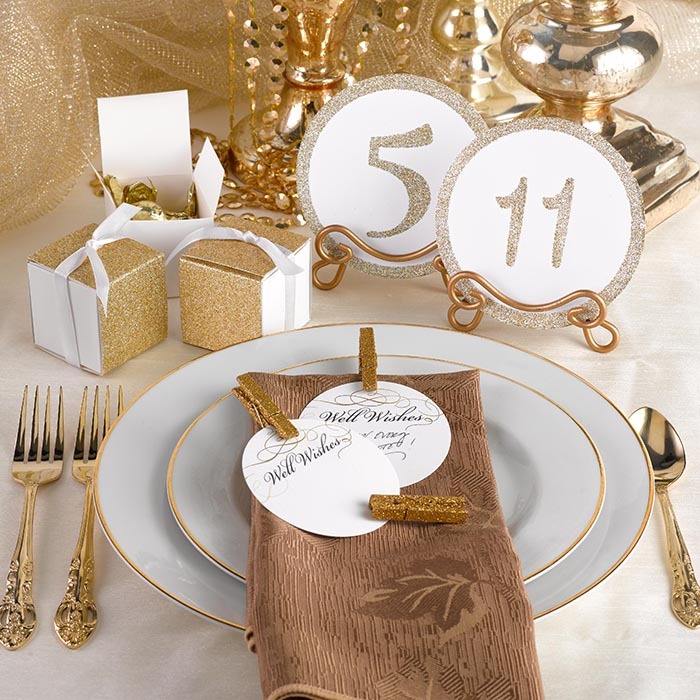 Use glitter table numbers, vases or favor boxes. It’s subtle and just the right amount of glamour! 2. The cake or cupcakes – throw some edible glitter dust on that gorgeous wedding cake (or cupcakes) and it becomes a twinkling masterpiece! This idea isn’t over used, so it will be a nice, unique touch to your wedding. 3. Bridesmaids- it is super on trend right now to have bridesmaids dress in elegant glitter dresses that make them shine! If you aren’t into having your bridesmaids shine THAT much, try giving them glitter hairpieces. Or if you want to keep all the sparkle on yourself, use a veil that has a little shimmer. And if the veil isn’t your style, use a hairpiece instead! 4. Invitations – the best for last, of course one of the simplest ways to incorporate glitter would be with yourinvitations. 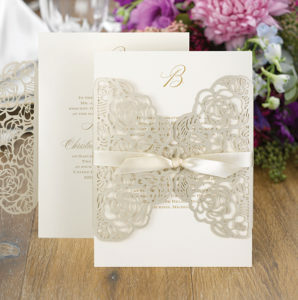 Use glitter accents within a design, backer or envelope liner to get guests excited for your special day. Those are just a few of our favorites, but who are we kidding? 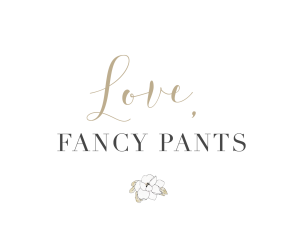 Glitter goes with everything –bouquets, shoes, wine bottles and corks, place cards, glasses, aisle runners, flowers, boutonnieres… and we could go on and on if you let us! PeacePix Photo Booths wins Weddingwire Couple’s Choice Award! Show support for Law Enforcement and be a part of something wonderful! While families around the country are preparing for a day spent with family and friends, feasting on a lovingly prepared meal and enjoying the countless football games that will surely follow, thousands of law enforcement officers will be working to protect our communities. For officers working on Thanksgiving, the fact that family and domestic partner violence typically increases 22% on this day is no surprise. There are increased calls as family members who normally manage to avoid each other get into more than just heated arguments not to mention custody disputes between divorced or estranged parents. Add alcohol and passionate football rivalries to the mix, and officers have their hands full. Later in the evening, the crush of “Black Friday” shopping begins with many retailers opening their doors to large crowds vying for limited “door buster” specials and the potential for disorder increases dramatically. The emotional toll of working Thanksgiving can be substantial for an officer and his or her family. Many officers feel like they are disappointing children, spouses, other family members, as well as themselves. Additionally, because the holidays are a time for reflection, officers, like anyone else, are susceptible to feelings of melancholy. Anyone that has an emergency has access to help because of these men and women who give selflessly of themselves for less pay than most fast food managers. While serving as a police officer does come with its personal rewards, the dangers and lack of respect or appreciation shown by so many as of late, are extreme. These officers have families; they are our sons, daughters, fathers, mothers, sisters and brothers. They are heroes and they have earned our gratitude. In 2015, a group of businesses and individuals came together to show their gratitude to our local law enforcement personnel. With the help of many wonderful people, we were able to provide a traditional Thanksgiving dinner to about 130 police officers in Cobb County. This effort became known as “Blue Thanksgiving” and was a huge success. Officers in Marietta, Kennesaw, and Cobb County Pct. 1 were provided hot meals on Thanksgiving Day. In addition, the Riverdale police department was provided trays of Danish, sandwiches, chips and desserts, delivered by our son, an officer in that department, who worked a 12-hour shift that day. This year, we are once again planning to provide Thanksgiving dinner to these fine men and women, and we hope that you will join our effort. If you would like to help, either physically with food preparation and/or delivery or financially with a donation, please contact us. Your contribution will be recognized in a poster-card delivered along with the meals, but, more importantly, this will be one of the most satisfying things you will do this holiday season. The police officers will appreciate not only the hot meal, but knowing that their service and their sacrifice is recognized and appreciated. To find out more, or to volunteer to help, call us at 770-419-4027. You can also contact us at kimpeacehill@comcast.net or via facebook atwww.facebook.com/bluethanksgiving. Donations can be sent to PO Box 5238 Marietta, GA 30061. You can also call, and we will come pick up! Please make checks payable to “Blue Thanksgiving”. Thank you and Happy Thanksgiving to you and your family! Sure glitter can add sparkle, but foil can add a bright shine and elegance to any design. Your guests will notice the distinguishable addition of a foil stamped invitation, setting yours apart from all the rest! The process of foil stamping has evolved and simplified from the late 1800s. A custom invitation can now be created using heat, pressure, metal dies and foil films, available in a variety of distinct colors. Foil invitations are so popular that we can guarantee you won’t be disappointed. Choose from a variety of design styles, add an amazing foil color, and we’ll craft an unforgettable invitation. Wheat ears on the wooden background. Top view. calendars. And it can be extra fun if you are planning a rustic wedding; this popular theme offers so many different options! Of course you’ll want to find a save the date that reflects your rustic wedding’s unique theme, style, and palette. This fun Rustic Sign Post Save The Date sets the tone, incorporates the perfect rustic elements and we think it would look great with your wedding. 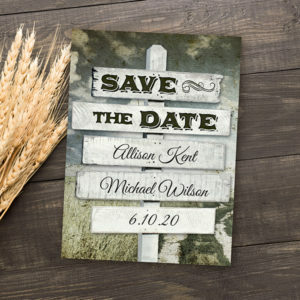 Incorporating the fun, rustic theme of the invitation throughout the rest of your day is simple! Add touches of natural beauty to your wedding attire by using burlap and lace in your boutonnieres and bouquets, and pin delicate wild flowers to your hair-do. Decorate tables using real wood slabs with wild flower and burlap arrangements as your centerpieces and place candles around the tables for ambiance. You could also hang up rustic wooden signs around the venue so guests know where the bar or the dessert table is located. And for an extra special treat, serve your guests drinks in mason jars. Your guests will be counting down the days until your fantastic rustic wedding that will have them putting on their cowboy boots and dancing!